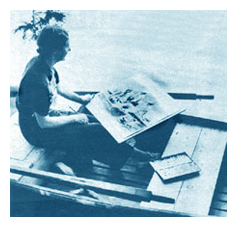 In early 1938, it was Mary S. Lawrence who first sent out letters to artists whom she hoped might be interested in organizing a society of watercolor artists. The first organizational meeting was held at the Montclair Museum on April 5, 1938. The group was formed by professional artists who hoped to change things because they felt that watercolor did not get the attention it deserved and there were no exhibitions held exclusively for watercolor painting in New Jersey at that time. A Member Show was arranged for the fall of 1938 and the First Annual Open Exhibition was held at the Centre of The Arts in East Orange in February, 1939. World War II soon intervened and the actively growing group went into hibernation for the duration. The 50th Anniversary of New Jersey Water Color Society was celebrated in 1988 with a traveling show held at the site of its first organizational meeting, the Montclair Museum, as well s the Monmouth Museum and the Noyes Museum. This year the Society commemorates its 60th Anniversary with the publishing of Portraits/2 which features brief biographies and examples of the art of each elected member. NJWCS is one of the few remaining art organizations to jury and judge show entries from the original work. The society holds an annual Dinner Meeting each spring for all members and associates and provides workshops and demos which are open to the public during the year. Watercolor also spelled WATERCOLOUR, pigment ground in gum, usually gum arabic, and applied with brush and water to a painting surface, usually paper; the term also denotes a work of art executed in this medium. The pigment is ordinarily transparent but can be made opaque by mixing with a whiting and in this form is known as body colour, or gouache; it can also be mixed with casein, a phosphoprotein of milk. Watercolor compares in range and variety with any other painting method. Transparent watercolor allows for a freshness and luminosity in its washes and for a deft calligraphic brushwork that makes it a most alluring medium. There is one basic difference between transparent watercolour and all other heavy painting mediums--its transparency. The oil painter can paint one opaque colour over another until he has achieved his desired result. The whites are created with opaque white. The watercolourist's approach is the opposite. In essence, instead of building up he leaves out. The white paper creates the whites. The darkest accents may be placed on the paper with the pigment as it comes out of the tube or with very little water mixed with it. Otherwise the colours are diluted with water. The more water in the wash, the more the paper affects the colours; for example, vermilion, a warm red, will gradually turn into a cool pink as it is thinned with more water. The dry-brush technique--the use of the brush containing pigment but little water, dragged over the rough surface of the paper--creates various granular effects similar to those of crayon drawing. Whole compositions can be made in this way. This technique also may be used over dull washes to enliven them. America's contribution to the international watercolor tradition is second to none. Although the British dominated that tradition in the past, American artists have produced a substantial and varied body of work in watercolor that is unmatched elsewhere in the world since the late eighteenth century. An unpredictable medium, the character of watercolor is uniquely challenging. The accomplished watercolorist learns to take advantage of the unexpected results of the medium. As practiced by most of its greatest masters, spontaneity is everything. The artist learns to improvise, which can be done effectively only with experience. The intimacy of the medium springs from the way it encourages improvisation and seems to record the artist's fleeting thought on paper. Watercolor, also known in French as aquarelle, is generally described as painting with water-soluble pigments on paper. Most commonly the pigments are suspended in a vehicle or binder of gum arabic. The classic painting technique was perfected in England during the eighteenth and nineteenth centuries. The pigment was applied in a series of transparent washes that allowed light to be reflected from the surface of the paper through layers of color. This technique gives watercolor its unique glow. Washes are layered to increase density and transform color already laid down. With this method, the colors are mixed by the viewer's eye and create a unique visual characteristic. On the other hand, gouache, or body color, is another form of watercolor. The pigments are mixed with zinc white and are opaque when applied to a surface. Alternatively, tempera involves combining the color with casein , a milk derivative, or with egg yolk as its binder. Another form of water-soluble pigment is the synthetic-polymer paint, widely known as acrylic. Even though acrylic can typically be used like oil paint, many artists have used it in a manner that echoes the watercolor tradition. Watercolor is a tradition that spans the chronicles of history. Primitive man used pigments mixed with water to create cave paintings by applying the paint with fingers, sticks and bones. Ancient Egyptians used water-based paints to decorate the walls of temples and tombs and created some of the first works on paper, made of papyrus. But it was in the Far and Middle East that the first watercolor schools or predominant styles emerged in the modern sense. Chinese and Japanese masters painted on silk as well as exquisite handmade paper. Their art was filled with literary allusion and calligraphy, but the primary image was typically a contemplative landscape. This characteristic anticipated what was to be a central aspect of Western watercolor traditions in later centuries. In India and Persia, the opaque gouache paintings created by the Moslems depicted religious incidents derived from Byzantine art. During the Middle Ages, monks of Europe used tempera to create illuminated manuscripts. These books were considered a major form of art, equivalent to easel painting in later years. Taking many years of service to complete, the monks copied the scriptures by hand onto sheets of parchment made from sheepskin, or vellum made from calfskin. Sometimes, entire pages were decorated with elaborate scrollwork and symbolic images. The most famous illuminated book was by the Limbourg brothers, Paul, Herman, and Jean (Flemish, c.1385-c.1416). This calendar, "Les Tres Riches Heures du Duc de Berry" or sometimes called "The Book of Hours," was created about 1415. Medieval artists also worked in fresco which continued throughout the Renaissance. Fresco is a method by which pigments are mixed with water and applied to wet plaster. This method was used primarily to create large wall paintings and murals by such artists as Michelangelo (Italian, 1475-1564) and Leonardo da Vinci (Italian, 1452-1519). The most famous fresco is Michelangelo's Sistine Chapel of the Vatican painted from 1508 to 1512. Paper has also played an important role in the development of watercolor. China has been manufacturing paper since ancient times. The Arabs learned their secrets during the eighth century. Paper was imported to Europe until the first papermaking mills were finally established in Italy in 1276. A few other mills developed later in other parts of Europe, while England developed its first mills by 1495. However, high-quality paper was not produced in Britain until much later during the eighteenth century. Since paper was considered a luxury item in these early ages, traditional Western watercolor painting was slow in evolving. The increased availability of paper by the fourteenth century finally allowed for the possibility of drawing as an artistic activity. So artists like Leonardo da Vinci and Michelangelo began to develop drawings as a tool for practice and for recording information. Albrecht Durer (German, 1471-1528) is traditionally considered the first master of watercolor because his works were full renderings used as preliminary studies for other works. Over the next 250, years many other artists like Peter Paul Rubens (Flemish, 1577-1640), Anthony van Dyck (Flemish, 1599-1641) and Jean Honore Fragonard (French, 1732-1806) continued to use watercolor as a means of drawing and developing compositions. With the production of higher quality papers in the late eighteenth century, the first national school of watercolorists emerged in Britain. This watercolor tradition began with topographical drawings that proliferated in the late seventeenth and early eighteenth centuries as Britain began to grow as a world power. These map-like renderings encompassed visual identity of ports of sea, as well as the surrounding landscape. In 1768, influential topographers founded the Royal Academy which encouraged watercolorists to carry the medium beyond their own technical achievements. The most talented watercolorist from this period was Joseph M.W. Turner (English, 1775-1851) who went on to become one of the greatest painters of the nineteenth century. His contemplative landscapes were tremendously influential on dozens of artists during later decades. The technology of watercolor developments corresponded with the evolution and advancement of the British school of watercolorists. In the 1780's, a British company began producing paper made especially for watercolorists which was treated with sizing, or glazing, to prevent washes from sinking into the fibers of the paper. Early watercolorists ground their own pigments, but by the late eighteenth century the Englishman, William Reeves, was selling them in portable cakes. In 1846, Winsor & Newton introduced colors packaged in metal tubes. This growing technology encouraged many European artists to experiment with watercolors until eventually the tradition spread to America. The earliest watercolor drawings produced in America were created for factual documentation of the "new world." As early as the 1560's, European explorers carried this visual information back to the "old world". The first of these important artists was Mark Catesby (English, 1679-1749). He came to Virginia in 1712 and documented hundreds of species of American birds and plant life with hand-colored engravings. Catesby's prints foreshadow the ever-popular romantic and analytical depictions of American wildlife by John James Audubon (American, 1785-1851). Audubon did his first study in 1805. He eventually devoted himself to recording this aspect of the North American continent in a manner seldom equaled in any other medium. American artists worked in the shadow of European masters until the late nineteenth century. Gradually, skilled and talented artists like Thomas Eakins (1844-1916), Winslow Homer (1836-1910) and James A. M. Whistler (1834-1903) began to develop artworks which challenged European artists. The rise of American watercolor coincides with international rise and recognition of American painting. American artists embraced watercolor as a primary medium equal to oil painting. This was not common in nineteenth century Europe except in England. Both American and English artists utilized watercolor for important paintings. By 1866, the interest in the medium was so pronounced that the American Society of Painters in Water Color was founded and for the first time watercolors were shown in galleries among oil paintings. Although Americans inherited a technique developed by the British, they were more interested in experimenting with watercolor in their own way. American artists, therefore, created works which were uniquely individual in comparison. They were free of rigid English traditions and the slow evolution of the British school. In this way the American school was able to explode with an abundance of important figures between the 1870's and the revolutionary Armory Show in New York in 1913 which included John Singer Sargent (1856-1925), John Marin (1870-1953) and Maurice Prendergast (1859-1924). Each artist represented an individual and unique approach to the medium. Since there was no particular American school or style of watercolor, the entire group represented "individualism" as a key factor in American art. During the 1940's, artistic experimentation became a major focus in the New York art scene resulting in the development of Abstract Expressionism. Watercolor began to lose a certain amount of its popularity. It was not a medium which played a role in the evolution of the new movement in abstraction. Watercolors were small and intimate in scale and were subordinate to the huge canvases of the Abstract Expressionists. However, one such artist, Mark Rothko (1903-1970) utilized large areas of transparent washes and color staining on his canvases to create large scale works which were atmospheric, contemplative and reminiscent of the watercolor tradition. Later, a second generation of Abstract Expressionist including Sam Francis (1923-1994) and Paul Jenkins (b. 1923) also employed similar wash methods to produce transparent color fields on large canvases. By incorporating watercolor techniques into canvas painting, American artists not only re-popularized the medium but continued a long tradition of innovative experimentation.